The month of May has been full of activities. From May 1st to 11th, I had to attend OMF International’s Pre-Home Assignment Workshop in Hengchun to better prepare for our 1 year home assignment in the U.S. because one of the main responsibilities we have is to mobilize God’s people to take part in missions. Many make the mistake of thinking that sending missionaries or becoming missionaries themselves is the ultimate goal of missions, but it is not. The ultimate goal is to further God’s kingdom, and to that end, we all have roles to fill. Learn about the spiritual needs in different parts of the world. Often we are unaware of the spiritual poverty that exists in our world. Therefore we take no action. Pray for the gospel to be proclaimed to the unreached people, for more workers to be sent to the harvest field, etc. Go to all nations to share the gospel by becoming missionaries. Welcome & share the love of Christ with foreign students or professionals who are in the U.S. & who will return back to their own countries. Send missionaries to foreign countries to make disciples of Jesus Christ. Mobilize Christians by teaching & training them on how they can take part in the Great Commission. It is our prayer that during home assignment God will use us effectively to mobilize many God’s people. 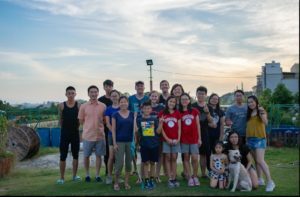 The latter part of May, we were also busy trying to finish up some ministries like College Bible Study, a special activity with college students, and missions training at our Gangshan Church. Although our responsibilities at Tandi gospel center will continue in June, we are truly grateful to the Lord for helping us to come to a good closure on some of the ministries. As we look back on our 1st term, we can’t help, but to be filled with emotions & gratitude toward God for His grace & faithfulness. We know without a shadow of a doubt that without God’s guidance, protection, provisions, intervention, it would’ve been impossible for us to make it through these past 4 years. Any transition, especially the ones with uncertainties can be quite stressful, but knowing the One who is gracious & faithful gives us the confidence to continue to serve God’s kingdom whether we are here in Taiwan or back in the U.S.